It’s been said that women’s novels have great characters but that they never do anything. That depends on what you mean by do. 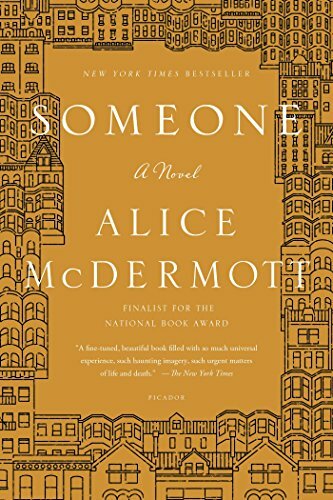 In Alice McDermott’s Someone, an unexceptional woman, Marie Commeford, is born into a lace-curtain Irish household in Brooklyn in the 1920s and undergoes familiar rites of passages—childhood, sexual awakening, work, marriage, children, and growing old. Such family and neighborhood-centered experiences—as lived by women at least—are often construed as non-events in a culture dominated by action adventure plots about heroic—and usually male—risk, struggle, and ultimate victory or defeat. But in Someone these “non-events” are rendered with such emotional and sensuous fullness that they bring home, with new force, the existential conditions in which we all live. The first of these conditions is mortality, which haunts the novel as it haunts our lives. Early on, for example, Pegeen Chehab, a neighbor girl who is trying to plan her romantic future, tumbles down some basement stairs and dies. Mrs. Hanson, the mother of Marie’s friend Gertie, is, for one moment, “as beautiful as a woman in a painting” smelling of “wholesome things, sunshine, oatmeal and yeast” and in the next she is “vanished forever.” Marie’s father slowly declines from cancer. Later, Marie will work in a funeral parlor and will herself encounter “death’s door” when she almost dies from a severe infection following the birth of her first child. A second condition is that of suffering, which seems to come from nowhere or from the hands of those who have suddenly turned cruel. Marie’s sensitive and beloved brother, Gabe, who has renounced his vocation as priest, is found wandering naked and weeping through the streets. An older man, Bill Corrigan, blinded in the First World War, is fooled by some neighborhood boys into believing that his mother has just been killed. Among the boys engaging in this cruel prank is the otherwise caring Gabe. No one is beyond hurting others. And Marie’s world is full of someones. So is ours. Maternal love is especially profound. During her brush with death, Marie sees her mother at her bedside and knows “that I was loved, cherished beyond all reason.” A motherly woman, a stranger, appears out of nowhere to follow the weeping Gabe and offer him a blanket to cover his nakedness. But love is not a language spoken by women alone. Men in this novel are painfully vulnerable, also caring, toward women and toward each other. Even the faithless Walter feels his heart break after his friend Bill Corrigan commits suicide. Toward the end of the novel it is Marie’s husband, Tom, who urges Marie to be more compassionate about Gabe’s secret life. Someone reminds us that, like their female counterparts, men are inevitably, if less visibly, immersed in the powerful, life-shaping emotions that come with living in families and in neighborhoods. Someone describes ordinary life with such richness of detail that it leaves us aware of how much we’ve taken for granted and no longer see, hear, or smell. But it does more. Someone presents domestic and communal living as something that not only veils “all that was brittle and terrible and unchanging” about our existence but that also mitigates their effects. If the end of the novel reminds us of Pegeen, the girl who falls to her death while planning her future, we are left with far more. In Someone, McDermott makes us see the depth and fullness of ordinary life while also deepening our investment in compassion and love. To read this novel is to feel the wonder of life anew and to become, however momentarily, a better person. Judith Newton is Professor Emerita in Women and Gender Studies at UC Davis. Her latest books are From Panthers to Promise Keepers: Rethinking the Men's Movement and the memoir Tasting Home: Coming of Age in the Kitchen.